Signs, symbols and mystic codes have always fascinated me. They also appear to be more popular now than they ever were. The brilliant writer Dan Brown is a doyen of such, and effortlessly weaves them into his exciting thrillers. 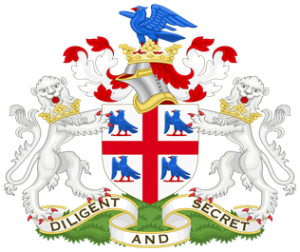 Even James Bond, the British secret agent has his own brand of associated insignia with his very own Coat of Arms1. The Latin words below the shield translate to: The World is not Enough — also the title of the film in which it was famed. Various groups: be them underground sects, devil-worshiping cults, secret societies or just your run-of-the-mill social club, all like to be associated, one way or another, to some influential symbol or emblem. This practice appears to go back to the dawn of time. Sometimes I find that by adding occasional symbols or cryptic images, it can add a certain degree of mystique or depth to a storyline. Not that I would want to use this all the time mind. That said, here is a sneak-peek at a symbol designed for a book I am currently working on. It is known as an ambigram, which basically means that this design of the word can be read from various angles, so look at the word upside down and see how it fairs. It is a wondrous style of artistic wording. For me, the masters of applying quality symbolism, and embedding or associating hidden pictographic narratives within their art work, are to be found at The College of Arms2 in London. For those of you who are not familiar with The College, it is the official heraldic3 authority for England, Wales, Northern Ireland and much of the Commonwealth including Australia and New Zealand. 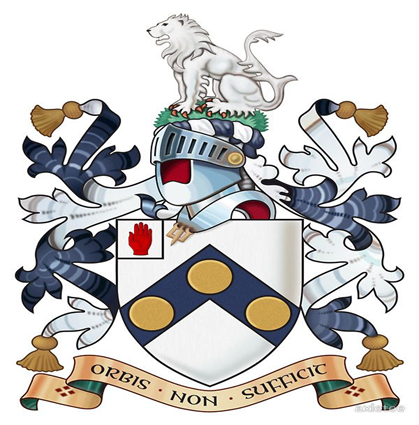 As well as being responsible for the granting of new coats of arms, The College maintains registers of arms, pedigrees, genealogies, Royal Licences, changes of name, and flags. Besides having ceremonial duties, they advise on all matters relating to the peerage and baronetage, precedence, honours and ceremonial as well as national and community  symbols including flags. They are situated at the heart of the city of London, and if you are interested in heraldry, then do stop by for a visit. It might also interest you to know that I was very fortunate a few years ago to be introduced to Robert Noel at The College, who has the grand title of Lancaster Herald. This title is for someone who is an English officer of arms at the college, appointed by a sovereign or state. He has a tremendous mastery of the English language and has been a stalwart member at the college for many years now. Those of you also familiar with my Wolfdog thriller, may even have noticed that Mr Noel very kindly wrote the foreword. His generous words can be found in the book, or indeed on my website. ~ Coat of Arms1: a visual design created on a shield, depicting various achievements, traditionally unique to individual persons, families, states and organisations. The coat of arms usually includes a shield, helmet, and crest, together with any accompanying devices, such as supporters, badges, heraldic banners, and mottoes. The Collage of Arms2: a royal corporation consisting of professional officers of arms with jurisdiction over England, Wales, Northern Ireland and some Commonwealth realms. 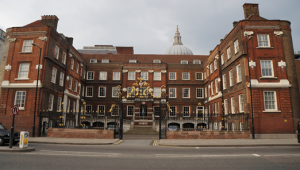 Since its re-incorporation on the 18th July 1555 the College’s home has been on the same site in Queen Victoria Street in the City of London. Heraldic3 (or Heraldry): a broad term encompassing design, display and study of various past achievements unique to these said individual persons, families, states and organisations.